Pro Logic items, including this cast-iron wok, are pre-seasoned with a proprietary "electrostatic" vegetable oil spray system. This readies the wok for cooking right out of the box, saving you time by pre-seasoning the wok for you. The oil spray system also creates a nonstick finish that helps preserve the cookware. Subsequently, you may be paying more for this wok than others, but it's an investment that will pay for itself many times over as you pass the wok on to future generations. The wok, which measures 14 inches in diameter and 4 1/2 inches deep, allows plenty of room to cook family-size meals. 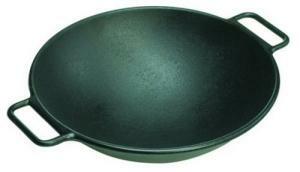 With its heavy-duty cast-iron construction and unique flat bottom, heat spreads evenly across the wok and up its gently sloping sides. Food heats evenly, the temperature never wavering. This is ideal for stir-frying, braising, and simmering. Because the base is flat, this wok can be used directly on an electric or gas range without a ring to hold the wok steady. This helps the heat rapidly transfer from the burner to the wok. Two large loop handles make the wok easy to handle. Hand washing is recommended, as with all cast-iron cookware, but the wok's rustproof, nonstick finish makes cleaning easy. There's no need to take risks with another product when everything you could want in a wok is right here. Besides, the wok comes with a lifetime warranty, making this one of the safest investments you'll find in today's market.